Dr Fraser Hunter explores the impact of the Romans on the peoples of northern Scotland and offers a critical review of the role of Rome in the emergence of the Picts. From the later 3rd century, Roman sources start referring to the Picts. This is often seen as a confederation of tribes in the face of Rome - but does the archaeology support this? By studying Roman objects on Iron Age sites, he charts periods of boom and bust. He suggests there was a deliberate attempt by the Romans to manipulate local politics by favouring some groups over others to create tensions. The possible effects of this are considered. There is growing evidence of social collapse in north-east Scotland in the 3rd century AD. Instead of amalgamation of earlier tribes, do the Picts represent new power structures and political units emrging from the wreckage of traditional Iron Age societies? 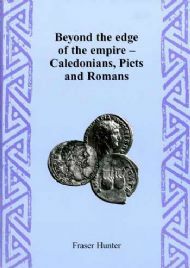 An appendix catalogues unpublished Roman finds from north of the Forth-Clyde line.